Due to several flash floods of the past two month of June and July, many areas of New Jersey contain weak soiled trees, that are destined to fall. North Jersey Tree Service provides tree removal in North Jersey and can analyze weak soil or trees. North Jersey Tree Service, tree removal professionals. "Whenever there is a storm, we are there to clean up tree damages," says the company owner. "We own all of our trucks and equipment, and have the same guys working the equipment with each other day in and day out. This makes the work go by quickly"
While New Jersey has produced great efforts to get shore towns restored for this year’s beach season, there are still several areas of the state that still have fallen trees in need of removal. The USA Today reported that at least 15 scenic lakes are filled with debris and fallen trees. Recent severe storms have caused the problem to escalate over the past few weeks. Flash flooding has caused several of these lakes to overflow. A severe storm that took place on July first knocked over many trees and powerlines, specifically in New Providence and Berkeley Heights. The extreme amount of rain that has fallen this past June has damaged the soil, according to USA Today. As the soil erodes, the trees weaken and can easily fall. This can affect the overall health of the surrounding trees. It may be crucial to remove or prune these damaged trees before the damage spreads. 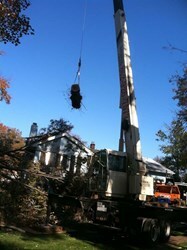 North Jersey Tree Service is a professional company that provides tree removal in New Jersey. Throughout the past eight months following Hurricane Sandy, they have worked to remove fallen and damaged trees in Morris and Bergen Counties, as well as much of Northern New Jersey. There are still many trees left with dangerous hanging branches. They also provide tree pruning and tree trimming which not only eliminate hazards of falling, but also improve the health of the tree. While much of the trees have been cleaned up, there are still many pockets that have been missed. North Jersey Tree Service works to remove these fallen trees throughout Bergen, Passaic, Morris and Essex Counties.